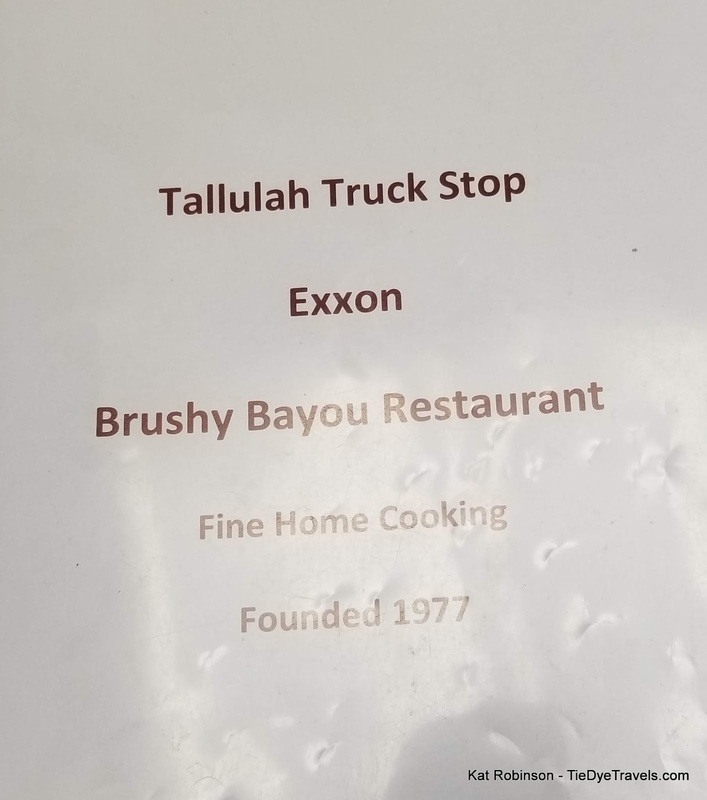 Road Eats: Brushy Bayou Restaurant and Truck Stop in Tallula, Louisiana. 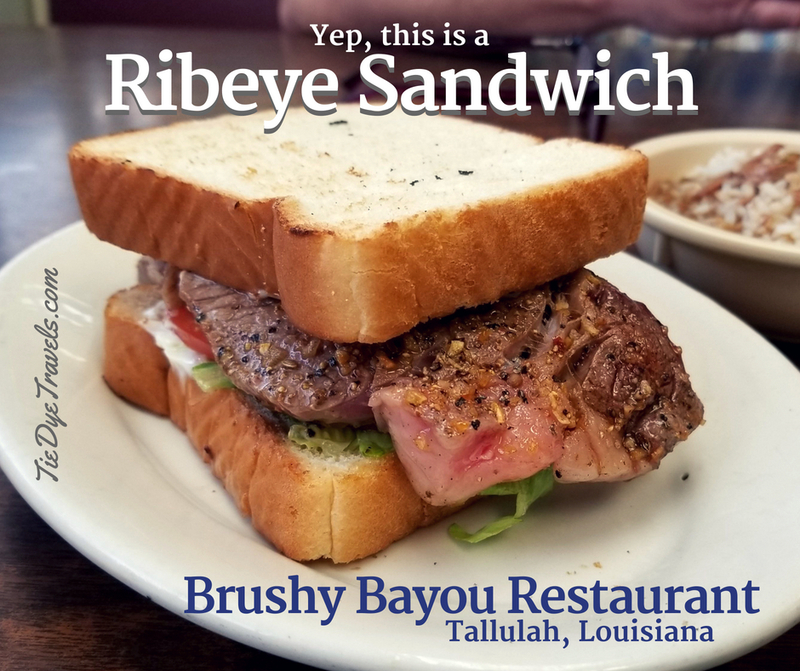 Ah yes, Brushy Bayou, where Sundays mean buffet and when you ask for a ribeye sandwich, you really get a ribeye sandwich. Seriously. Grav and I were on our way back from a weekend in and around Vicksburg, Mississippi. It was early, we were exhausted, and I had a blooming case of poison ivy. There was grumpiness about us. We weren't in the mood for chain restaurants, and we sure as heck weren't up to a Chinese buffet. Food was going to be had before we started the haul up US Highway 65, and since I wasn't feeling up to waiting until we got to The Dock in Providence, we were out of choices. It was either a Country Pride, or this restaurant at the back end of a truck stop. Right at 11 a.m., we pull up to a building straight out of the '80s advertising a casino, bait, gas and a restaurant. Doors on the south side of the east face took us into a wood paneled vestibule, to the left of which were the restaurant. There were a scant handful of people scattered inside, and a small buffet stretched out behind the register island. I wasn't wearing my hat, or a bra, or my own clothes for that matter. I itched. 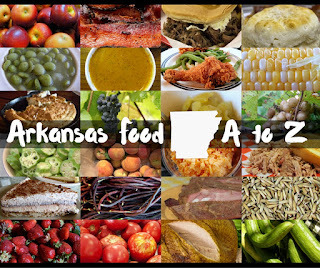 There was fried chicken and beans with ham and fried catfish, rice, green beans, brown gravy, hush puppies and slices of cake on individual plates. I itched. For $13.99 I wasn't going to do justice to any buffet, and all I really wanted was to sit down. So that's what we did. Grav, poor thing, was tired and dehydrated and not thinking straight. 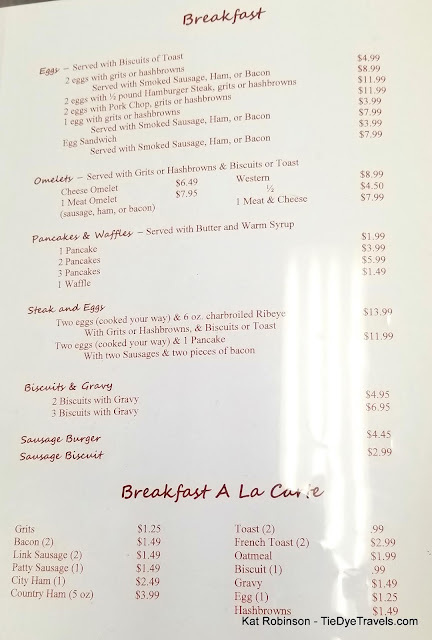 We usually garner some sort of breakfast at our hotel, but the LaQuinta in Vicksburg was lacking in good pork-free protein and the breakfast area was full of kids in bathing suits. The coffee had been somewhat sludgy. We'd been at the end of the hotel opposite the elevators and even with a rolling cart the load-out had been excruciating. A full day in 90+ degree sunlight wearing layers of costume had drained our will. We were deflated, and our mutual fall to the lower than usual booth seats in the second stall from the door felt like the whole experience come to a point. He even winced as he hit the padded bottom. Bless her heart, our waitress came and got our drink orders and disappeared. We sat there, looking at each other from across the table. Grav pulled out his phone as if to play a little Pokemon, but his interest drifted away and his eyes appeared cloudy. I felt my belly roll as the mere thought of coffee came up and sank away again. I itched, and when it came I held tight to my cup of iced tea hard, willing away the need to scratch. My eye was about swollen shut. I wasn't wearing my hat, so there it was, in full view of everyone. The drinks came, and we stared at each other some more, before it occured to me that we should get a menu or two. Our waitress, a young woman barely in her 20s, looked over at us and caught my eye. "Menus?" I sighed, and she shot up and grabbed a couple to bring to the table. It crossed my mind that maybe she'd found sludge in a coffee cup, too. 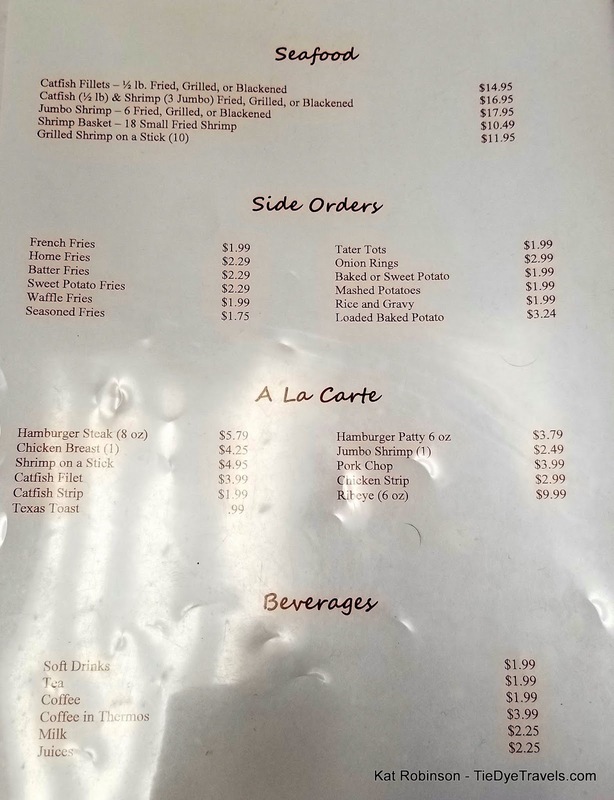 The menu... was... not the same resource as Google had popped up when I asked for area restaurant menus. That version was apparently dated, and the prices were higher than we'd seen. Not too high, mind you, but high enough. The four pages of offerings were all over the place - a page of breakfast that had already passed (we thought); a page with double-digit seafood offerings in the key of catfish, catfish and three sorts of shrimp along with thirteen side dishes, eleven of which (French fries, home fries, batter fries, sweet potato fries, waffle fries, seasoned fries, tater tots, baked potato, baked sweet potato, mashed potatoes and loaded baked potato) were potatoes; a third with listings for kid's meals, entrees and appetizers (in that order); a fourth with soups and salads, signature dishes, steaks and chicken all listed. Grav's eyes rolled over it with a little interest, which kept getting lost. I ordered him some batter fries, because heaven knows he needed something. Those batter fries came out about the same time we were ready to actually place our lunch order. They were not as expected. I've had my share of battered and seasoned fries. 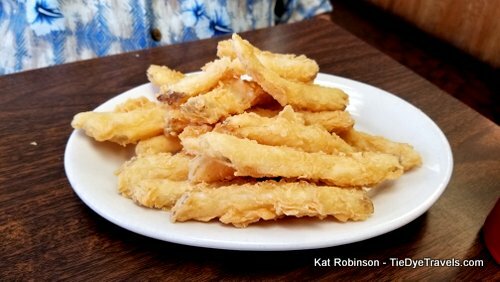 These more greatly resembled those few fries I've had in Japanese restaurants - a very lightly salted tempura batter, in which each plankish potato strip was dunked before being tossed into a deep fryer. The fries were blonde but the potato within was fully cooked, and they bore a magnificent texture to them. 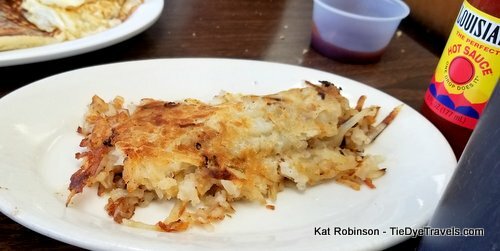 I am to understand that this type of batter fry is particular to this area, with other appearances made on menus in Vicksburg and surrounding areas. They were for Grav, but I found myself not only sneaking some from him but eating the remainder we had taken with us, cold, somewhere around Dumas a few hours later. They didn't require ketchup. Grav was beginning to perk with a combination of Coke and fries, and he was ready to place his real order, as was I. It was not easy - both of us had considered po'boys, but had already consumed a couple of those at, of all places, the Little Rock Markham Street Popeyes just a few days before and had been so underwhelmed that neither of us had availed ourself of a more worthy contender since. Spaghetti and meat sauce sounded possible for me, but I wasn't in the mood to talk to much of anyone and didn't want to go through the dance of seeing what meat was in the sauce because I itched, I couldn't open my right eye much at all, and I was damn hungry by golly. I needed some food. I ordered the steak sandwich and didn't think about it as I chewed on one of Grav's fries. 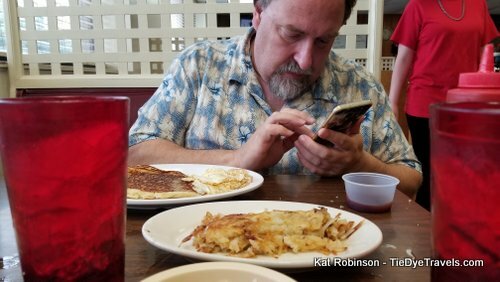 He ordered a breakfast and I scooted off to the restroom, which was just as 1980s rural kitsch as I expected. I get back, sit down, and here comes our waitress with dishes. 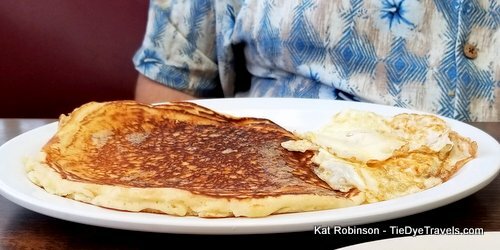 She sets down a big flat pancake by Grav, which would have taken up the plate had it not been for the single, crumpled up fried egg on the end. She came back with hash browns, and Grav got his fork into all of that. Me? 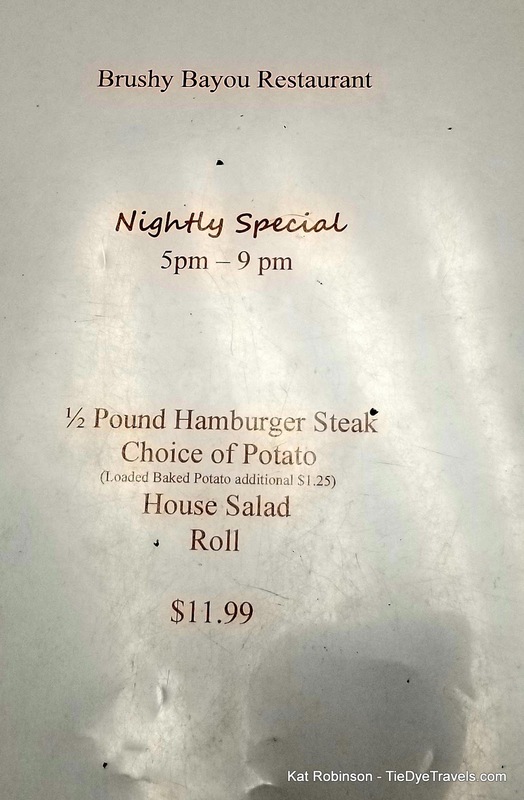 I had been brought a sandwich with lettuce, tomato, mayo and a six ounce or better ribeye steak. No, really, a real steak. Not a countryfried steak. Not Philly cheesesteak. This was a hunk of fat-on-the-end, well seasoned inch-thick steak on Texas toast, dressed like a sandwich. Pretty sure my brain was broken at this point. I took photos. I looked at it. I stared. I ignored it while my brain tried to process what it was seeing, and I concentrated on the white rice and brown gravy. 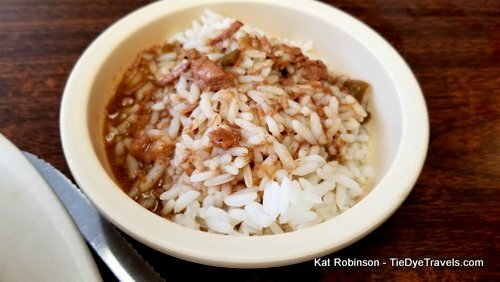 To the credit of the restaurant, this was a Delta dish I could recognize, with a rich roast beef gravy and plenty of debris over a cup of white rice. It was filling - not phenomenal, but the sort of thing I would eat if I'd been in my right mind, on the road by myself, and cold. Did I mention we were still dehydrated from a day in the 90+ degree sun wearing multiple long-sleeve layers? No? Ah, but putting it in my mouth made me feel like I was sitting in that booth instead of renting my brain out to the cosmos while my eyelid and the side of my face throbbed itchingly. I took several bites. And then I looked back at my steak sandwich and thought "so why did I get a side of meat and bread with my dinner of meat and bread?" Such an odd thing. It just looked crazy, like what happens when someone in a hurry eats at a Sizzler - grabbing the toast on the side of the plate and slipping in a steak to wrap in a napkin to go. It was almost too neat on the bread. 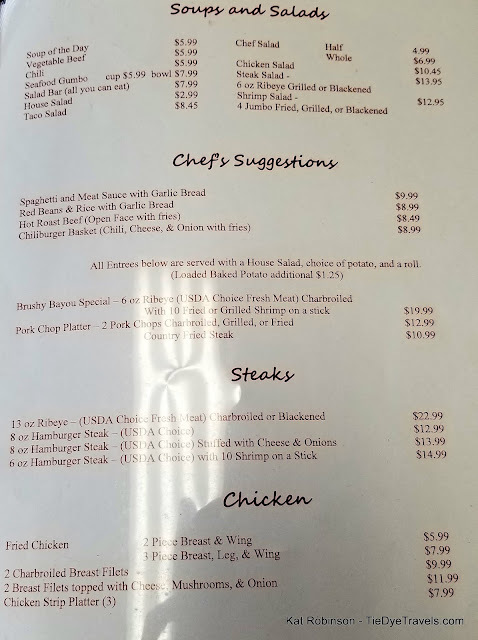 It reminded me of that time when I was pulled off the road in Humboldt, Tennessee by a spicy rub and was served a smoked chicken leg quarter, bone and all, on white bread. That was when all the starch I'd eaten kicked in. I wanted meat. I picked up that sandwich with both hands and bit in and kept biting and sawing with my teeth until I got through that bite. Because yes, this was an actual six ounce ribeye steak, not a chicken fried round or even a loose meat burger right out not there... it was a superb, medium-rare, slightly saltier than I care for seasoned, lightly crusted steak. And I wondered why I didn't eat all my steaks this way. I didn't need a steak knife. I'm a 44 year old woman with poison ivy and a nearly complete set of teeth (perfect save the removed wisdom teeth) and two hands to crush together bread into the very fissures of the marbled meat between them. Conversation halted for a while. See, once I picked up this ribeye sandwich, putting it back down was out of the question. The only way to contain the construct was to clamp it together and eat it between my fingers. Letting go would have lead to mess. Grav stabbed his eggs a bit and poured a sea of what tasted to be Johnny Fair maple-flavored corn syrup onto his pancakes. As he woke up more, he dug in more ferociously, almost gobbling his last few bites. I offered him some brown gravy rice and he demurred, slicing away at the single pancake and dabbing each bite into mroe syrup. The fries, forgotten, looked at me and dared me but I was too entangled with my sandwich. I was licking each finger from its moist payload of greast, mayo, tomato and soggy bread by the time it hit me I had inhaled that damn steak. 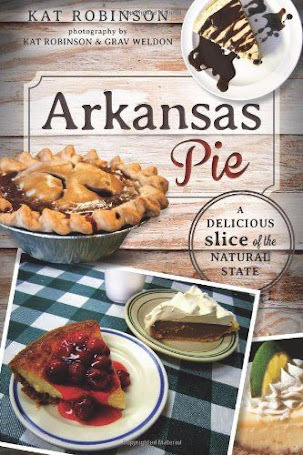 We were on our fourth or fifth giant cup of beverage each, my unsweet tea and his Coke, and I needed to move. After packing away the fries, I sucked down some more brown gravy rice before giving up on it, already drowsy again. I handed Grav $30. Walking might help. Also, I needed to exercise my curiosity. I wandered past the entrance to the casino, which held no interest for me, down the hall into the convenience store. I kept hearing something that wasn't computing but which seemed very familiar. My first view was actually of a terrible craving I'd have about Lake Village, that could not be satisfied. 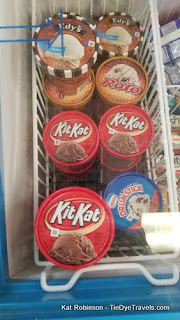 There were pints of Kit Kat ice cream, and though I was sated I wanted it so bad. But I didn't get it. I was still tracking down that sound. 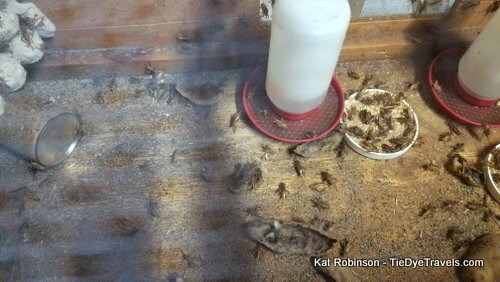 A cricket bin. 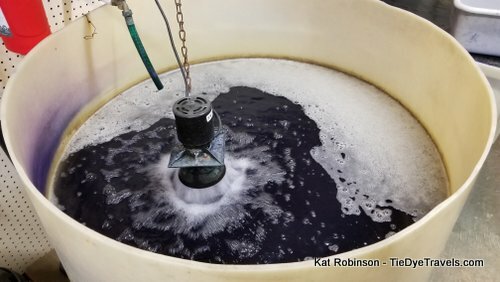 A couple of minnow tanks. 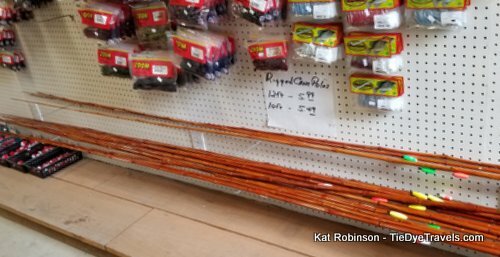 Ah, yes, the sounds that start an early morning of pole fishing. True to the words on the sign outside, there was indeed bait here, and I could smell hints of catfish-intended stink bait and plastic lures in the side shack for the convenience store, a full-scale old school bait shop with cane poles and line and man I bet I could buy a fishing license, too. But I itched, and I couldn't get my right eye open enough to focus well. 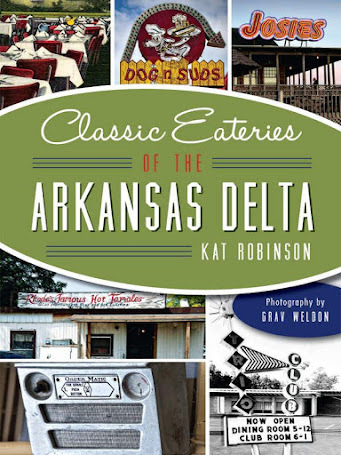 I did see with my left the kiosk by the door to the pumps that bore several shelves of various Panola Pepper Company sauces. We keep meaning to get to Panola when they're open but it hasn't happened these past few years. 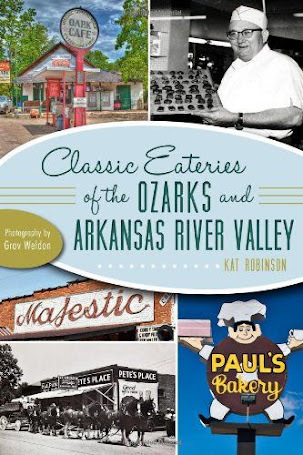 By this time Grav had the gumption to get out of the low booth - a feat for the man who once had seven ribs and a hip broken by an SUV through his car door - and settle at the counter. There was some horse-trading of bills, the last of which, a $5, he told the waitress to keep along with a couple of ones scooted onto the counter. We wandered outside. I grimaced at the heat and slid into the passenger's seat, where I angled pillows for a nap and to keep my fingers from my side so I wouldn't scratch in my sleep. Grav pulled out as I swallowed another Benadryl. I pretty much remained either asleep or in that Benadryl fog all the way home. At some point I had griped about not getting that Kit Kat ice cream and there we were in Dumas, sitting at the Exxon, Grav handing me a cone of German chocolate and cannoli scoops and me thinking I still had to find that damn Kit Kat ice cream because reasons. It's been a few weeks. The poison ivy has about run its course, I hope. I hadn't endured a dose so bad of the foul stuff in decades. I was loading the images from my phone into my computer when I saw that crazy, crazy ribeye steak sandwich, and I figured I should write this. 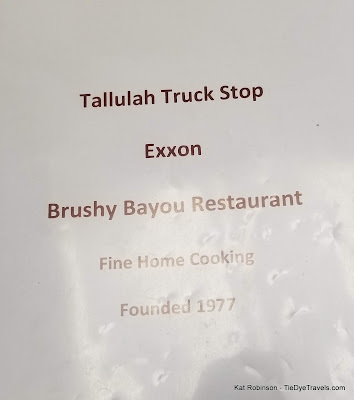 Brushy Bayou Restaurant has been around since 1977. Except for the prices on the menu, very little seems to have changed. 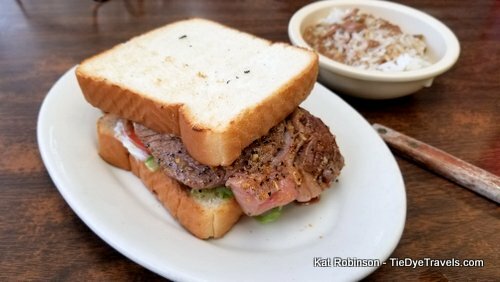 If you find yourself on a Sunday morning around Tallulah, or making the run across the top of Louisiana along I-20, it's worth a stop in for batter fries and a steak. 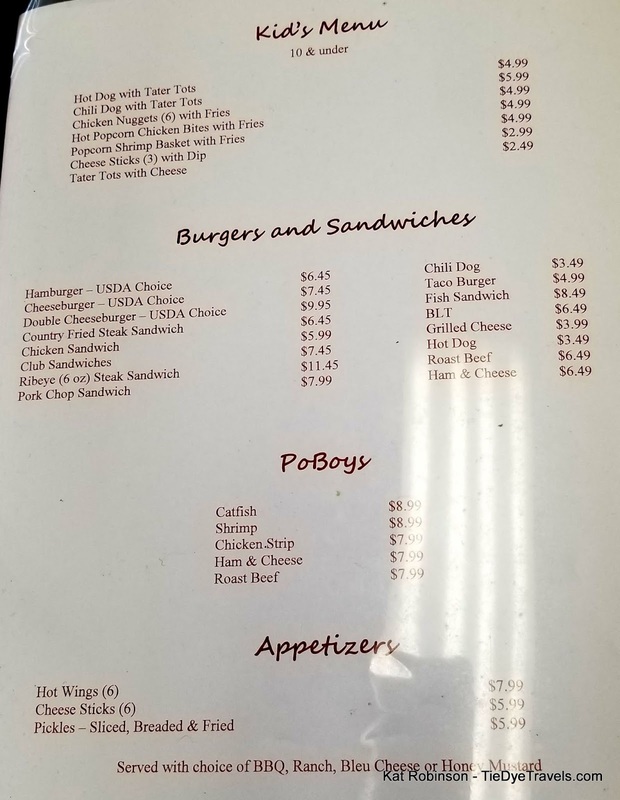 I think we may have to try the fried chicken next time, or even a po'boy. 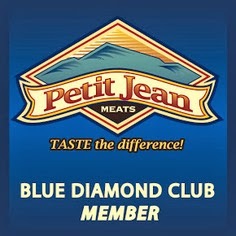 If you need more information, you can call the restaurant at (318) 574-1325 or check out the website. Click the menu pages to enlargen.